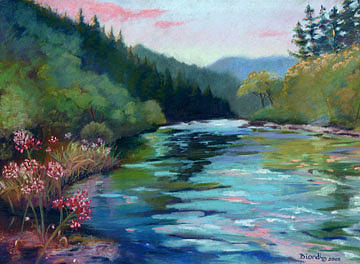 Mccloud River Sunset is a painting by Janet Biondi which was uploaded on November 5th, 2015. This was a scene that I lived and breathed for six years while living a the Bollibokka Club in Northern California. It's where I learned to fly fish and we lived in a beautiful cabin on 5000 acres close to this pristine river with bear, mountain lions, eagles and osprey as our neighbors. There are no comments for Mccloud River Sunset. Click here to post the first comment.